According to The Guinness Book of Records, Agatha Christie is the best selling novelist of all time. Her books have sold millions of copies and have been translated into over 100 languages. She is renowned as the author of numerous mystery novels and is credited with writing the world's longest running play, The Mousetrap. In 1926, this famous crime writer was the subject of a real life detective story. 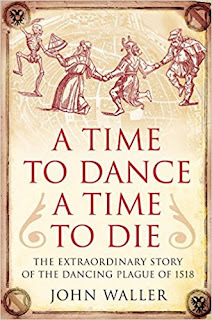 Christie, the queen of the "whodunnit" found herself involved in a perplexing mystery of her own.. At a very difficult time in her life, she went missing for 11 days. The disappearance of the popular author caused quite a stir and there was an extensive manhunt for her. The public, not knowing whether she was dead or alive, feared greatly for her safety. The Daily Mail offered a reward of 100 pounds for her location. 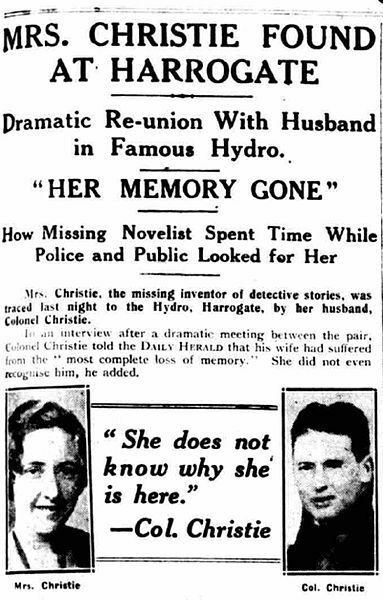 Without a doubt, Christie's 1926 disappearance remains the most intriguing episode of the great author's life. Agatha Mary Clarissa Miller was born in Torquay, Devon, England on September 15, 1890, the youngest of three siblings. She came from an affluent upper-middle class family. Her mother, Clarissa "Clara" Boehmer, was a Belfast-born Englishwoman. Her father, Frederick Alvah Miller, was a well-to-do American stockbroker, born in New York in 1846. 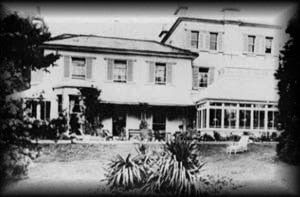 The couple married in April of 1878 and their first child, Margaret Fray "Madge" Miller (1879-1950), was born in Torquay. Madge was followed by a son, Louis Montant "Monty" Miller (1880-1929), who was born in the United States. 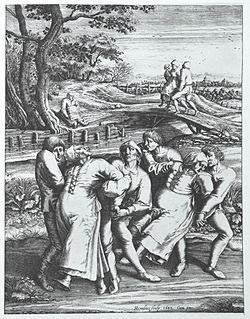 The Millers lived in America for a time, but eventually returned to England. While Frederick, who had financial interests in both Britain and the U.S., was away on business in New York, Clara purchased a Victorian mansion in Torquay, on the southwest coast of England. Upon his return, the family settled in the grand villa,called "Ashfield," where their youngest child, Agatha, was born. For the most part, Agatha enjoyed a happy childhood in her little seaside town. Her life at Ashfield was secure, although fairly insulated. She had a nanny called "Nursie" and was home schooled, at her mother's insistence. At the same time, however, she experienced loneliness. According to her autobiography, Agatha Christie: An Autobigraphy. this childhood loneliness fuelled her active imaginations and her creativity. She made up stores and imaginary characters. Agatha's idyllic childhood was shattered when her father, Frederick Christie, died on November 26, 1901. After his death, the 11-year-old Agatha and her mother experienced serious financial decline. Nevertheless, they continued to maintain their home by renting out Ashfield and travelling. 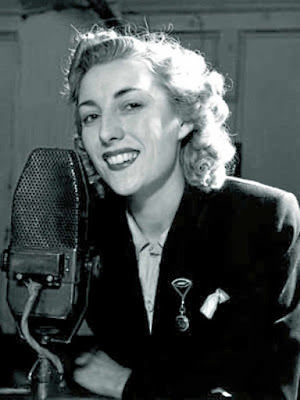 In 1906, at the age of 16, Agatha was sent to a finishing school in Paris to study vocals and piano, but was never able to establish a career as a musician due to shyness and stage fright. She did, however, retain a lifelong love of music and became a skilled pianist. 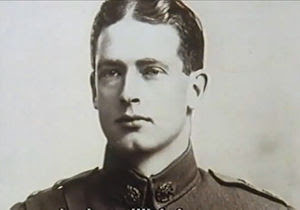 In October of 1912, Agatha met Colonel Archibald "Archie" Christie at a dance given by Lady Clifford at her home in Chudleigh, England, Archie, a pilot in the Royal Flying Corps, was born in India on September 30, 1889 and his father was in the Indian civil service. Agatha and Archie wed on Christmas Eve, 1914 and the nuptials took place at a church in Clifton, Bristol, England, the home of Archie's parents. During World War I, Agatha served as a nurse and tended to wounded solders at a Red Cross Hospital in Torquay. She then underwent training to work in the pharmacy as an apothecary's assistant. As part of her training. Agatha studied chemistry and became knowledgeable about poisons, including their lethal dosages. This knowledge became invaluable when she was devising plots for her detective stories. It added to their authenticity. That is why poison became the method of murder in her first novel, The Mysterious Affair at Styles, and in many other of her works. During the war, Archie was stationed in France, so he and Agatha were unable to see much of each other. It was at this time that Agatha first began writing detective fiction. After the war, she and Archie settled into a flat in northwest London and Archie took a position in a bank. On August 5, 1919, Agatha gave birth to the couple's only child, a daughter named Rosalind Margaret Clarissa. 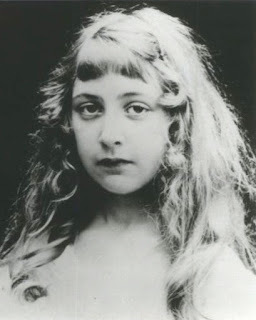 Agatha Christie published her debut novel, The Mysterious Affair at Styles, in 1920. Its plot centred on the murder of a wealthy heiress, but more importantly, the book introduced one of Christie's most enduring characters, Belgian detective Hercule Poirot. Christie's other major creation is Miss Jane Marple, an elderly village lady and amateur sleuth. Miss Marple's first appearance in a full-length novel was in The Murder at the Vicarage (1930). By 1924, cracks had begun to appear in the Christie marriage, one of the irritants being Archie's passion for the game of golf. 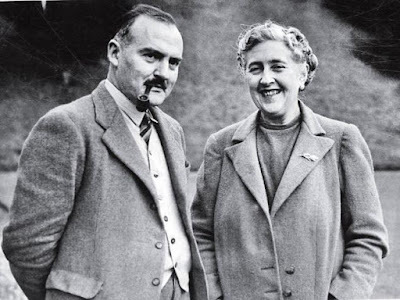 In 1926, Agatha released The Murder of Roger Ackroyd, which was very successful and warmly received. Her career had begun to flourish, but her personal life was in turmoil. She suffered two devastating blows that year. It was "a period of sorrow, misery, heartbreak," she wrote in her autobiography. In the early part of 1926, Agatha went on a vacation to Corsica without Archie. When she returned from her trip, she found her mother severely ill with bronchitis. Clara Miller died in April, just days after Agatha's return. 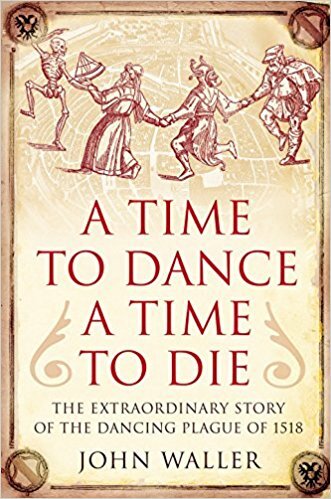 In June, soon after Clara's passing, The Murder of Roger Ackroyd was published and Agatha earned much acclaim. She was still grieving her mother's death, however, when she received a second devastating blow, this time delivered by her husband. Archie requested a divorce because he had fallen in love with another woman. The woman was Nancy Neale, a friend of the family who was a decade younger than Agatha. Unlike Agatha, Nancy shared Archie's interest in golf. 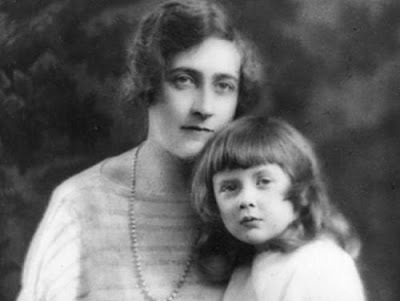 On the evening of Friday, December 3, 1926, around 9:45 p.m., Christie disappeared from her English estate in Sunningdale, Berkshire. She and Archie had argued and he had gone to spend the weekend with Nancy at Godalming, Surrey, England. A distraught Agatha left her sleeping seven-year-old daughter Rosalind and just drove away. Police soon located her car, a green Morris Cowley, on a sharp slope at Newlands Corner, near Guildford. The abandoned vehicle contained a bag of clothing and an expired driver's licence. However, there was no sign of the famous author and there was no evidence that an accident had occurred. Many feared she was dead and volunteers failed to find her. There were even rumours that she had been murdered by her unfaithful husband, Archie. Sir Arthur Conan Doyle, creator of Sherlock Holmes, joined the search for Agatha. Conan Doyle, an occultist, attempted to use paranormal powers to find the missing writer. He brought one of Agatha's gloves to a medium in the hopes that it wold provide a clue to Agatha's whereabouts. 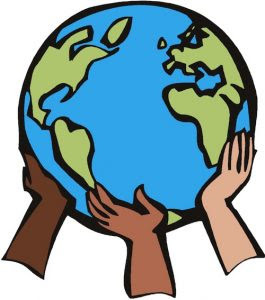 British author and crime writer, Dorothy Sayer also tried to help. She searched for possible clues at the scene of Christie's vacated car. There was concern that she may have committed suicide, but no body was found. On December 14, 1926, Agatha finally surfaced in a spa at Harrogate, Yorkshire. She was registered at the elegant Swan Hydropathic Hotel (now the Old Swan Hotel) as "Mrs. Teresa Neele"(the same surname as her husband's lover) from Capetown, South Africa. A hotel musician, Bob Tappin, recognized her and alerted police. They informed Archie who rushed to the hotel, identified his wife and brought her home. Tappin claimed the reward money for informing police of Agatha's whereabouts. Much of Agatha's disappearance remains unexplained. There is no reference to it in her memoir Agatha Christie: An Autobigraphy. Archibald Christie claimed that she'd suffered from amnesia as a result of the car crash. He publicly stated that his wife "has suffered the most complete loss of memory and does not know who she is." However, his comments failed to put a stop to the conjecture and numerous other theories regarding Agatha's disappearance. 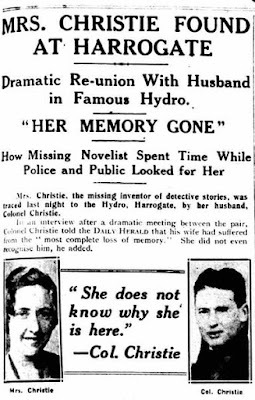 Some postulated that Christie's disappearance had been a publicity stunt for her novel. Jared Cade put forth another theory in his book Agatha Christie and the Eleven Missing Days (1998). Cade contended that Christie staged her own disappearance to embarrass and humiliate Archie. This theory was roundly rejected by Agatha's grandson, Matthew Prichard, a staunch defender of his grandmother's memory. In Agatha Christie: The Finished Portrait (2006), biographer Andrew Norman, who worked as a family doctor in the U.K. until 1983, argued that the crime writer may have been in a "fugue" state or psychogenic trance as a result of trauma or depression. Norman concluded that she was suicidal. "Her state of mind was very low," he declared, "and she writes about it through the character of Celia in her autobiographical novel Unfinished Portrait." By the end of 1927, Agatha Christie had recovered from her traumatic experience and had begun writing again. In 1928, she divorced her philandering husband and he wed Nancy Neale. Archie became a successful businessman and he Nancy had a son, Archibald, who was born in 1930. On September 11, 1930, Agatha married Sir Max Mallowan, a renowned British archaeologist who specialized in ancient Middle Eastern history. She met Mallowan while visiting her friends Sir Leonard and Katherine Wooley on an archaeological expedition at Ur, an important Sumerian city-state in ancient Mesopotamia. (now part of south Iraq's Dhi Qar Governorate). At the time of their wedding in Scotland, Agatha was 39 and Max was 26. Agatha accompanied her husband on his archaeological digs, taking photographs and keeping records. 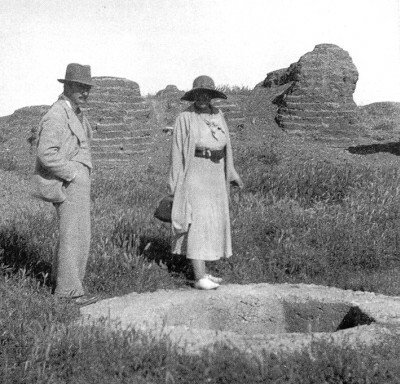 She often used the subect of archeology in her mystery novels, Below is a photo of her with Mallowan at Tell Halaf, an archeological site in northeastern Syria. Max Mallowan was knighted in 1968. In 1971, Agatha Christie was made a Dame of the British Empire by Elizabeth II at Buckingham Palace. That same year, she suffered a leg injury and her health went into decline. In 1974, Agatha made her final public appearance at the opening night gala of the theatrical version of Murder on the Orient Express. 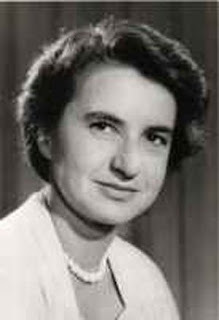 She died on January 12, 1976 in Wallingford, Oxfordshire, England at the age of 85. She and Max Mallowan remained married for 46 years - until her death. In 1977, Mallowan married Barbara Hastings Parker, a fellow archaeologist with whom he was reported to have been having an affair. Sir Max passed away on August 19, 1978 at the age of 85. 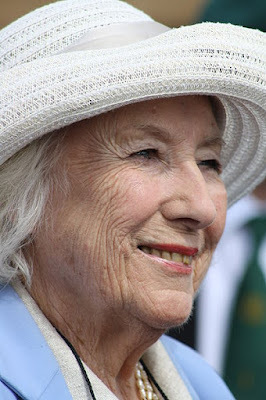 * Agatha Christie's daughter, Rosalind, died on October 28, 2004 at the age of 85 (coincidentally the same age at which her mother died). According to Rosalind's obituary in The Guardian, she "fiercely guarded her mother's estate, works and reputation. * Nancy Neale died in 1958 at the age of 58. Archibald Christie died four years later, on December 20, 1962. He was 73 at the time of his death. * Barbara Hastings Parker, the second Lady Mallowan, died on November 21, 1993 in Wallingford, Oxfordshire, England at the age of 85. * Ashfield, Agatha Christie's childhood home, was demolished in the 1960s to make way for an apartment block. A blue plaque on Barton Road in Torquay marks the spot where the villa once stood. * Agatha Christie wrote six novels under the pseudonym Mary Westmacott and they were not detective novels. One of them, Unfinished Portrait (1934), was the fictionalized account of her first marriage, which is why she hid her real identity. 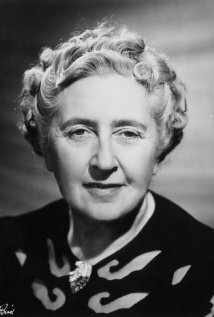 In Agatha Christie: An English Mystery, a 2007 biography, Laura Thompson writes : "She felt an absolute freedom writing those books. She could go wherever she wanted, into every idea that had ever fascinated her, even into the recesses of her own past - there was a sense that the revelation of her identity had closed a door: the one that opened into her most private and precious imaginative garden." In 1949, however, a London Sunday Times journalist blew Christie's cover. The last two of the Westmacott novels, A Daughter's Daughter (1952) and The Burden (1956), appeared after 1949 her secret was revealed. SOURCES: Encyclopaedia Britannica; Agatha Christie: An English Mystery (2007), by Laura Thompson; The Guardian; Wikipedia; Agatha Christie: The Finished Portrait (2006). by Andrew Norman; The Complete Christie: An Agatha Christie Encyclopedia (2000), by Matthew Bunson; Agatha Christie; An Autobiography (1977).